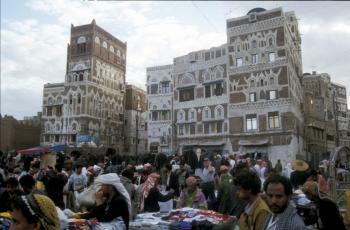 The Old City of Sana'a (with over 2.000 years of history) presents an unique homogeneous architectural ensemble. The design and detail of each of the houses combine into an integral beauty. 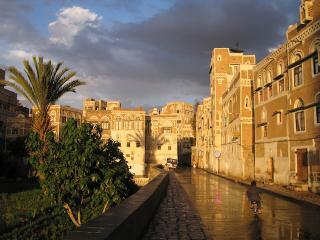 Sana’a is also connected to the spread of Islam in the early years of the Hegira (from 628). Surrounded by ancient clay walls which stand 6–9 metres (20–30 ft) high, the old city boasts over 100 mosques, 12 hammams (baths) and 6,500 houses. Many of the houses resemble ancient skyscrapers, reaching several stories high and topped with flat roofs. They are decorated with elaborate friezes and intricately carved frames and stained glass windows. One of the most popular attractions is Suq al-Milh (Salt Market), where it is possible to buy not only salt but also bread, spices, raisins, cotton, copper, pottery, silverware, antiques (both fake and real) and, formerly, slaves. The majestic seventh century Jami' al-Kabir (Great Mosque) is one of the oldest in the Muslim world. The Bâb al-Yaman (Yemen Gate) is an iconized entry point through the city walls and is over 700 years old. San’a is a city to wander round without a map and without any particular objectives other than soaking up the atmosphere. “Dive in” at the Bab Al-Yaman and just see where serendipity takes you. Oh, and have plenty of digital cards or film! Because of the narrowness of the alleyways and the height of the buildings it is worth going at different times of day in order to benefit from different positions of the sun. Some buildings will let you in and the views from the top over the city are worthwhile if you can find them/ obtain invitations. You will also get a feel for the enclosed gardens which dot the city but are largely invisible from the outside other than a few palm branches peeping over the walls! Damaged in War since WWII: "On 12 June 2015, Saudi-led airstrikes targeting Shiite rebels and their allies in Yemen destroyed historic houses in the center of the capital." Mosque: 103 mosques, "The majestic seventh century Jami' al-Kabir (Great Mosque) is one of the oldest in the Muslim world."